We stand out in the way we apply our solutions to different scales of businesses – starting from the smallest companies to the largest firms. Kore Projects has been a canopy holding a set of apps and solutions which are dedicated to solving problems for diverse businesses..
Timesheets are one of our many top features within Kore Projects. Timesheets are an easy alternative than paper trail. With timesheets you can fill them out daily or at the end of the week but we suggest you do it daily as the timesheets come off the price of the job and can be tracked each day. Timesheets are sent in real time back to the office. Even though your timesheets are saved through kore online you can also print them out and keep them as a paper trail. Jobs allow you to be registered to a job by the people up in the office/mangers. When you are registered onto the job you can see all job details and information and notes that have been entered about that job. status about that job relating to the notes. Our Kore Android App is very easy to use and navigate between scoping jobs, your projects, contacts and your user settings. Our Android app is designed so you can go out onto a job and be able to scope a job then and there on your phone and it saves into your scopes page online back in your office. Only staff in office are able to use the android app. 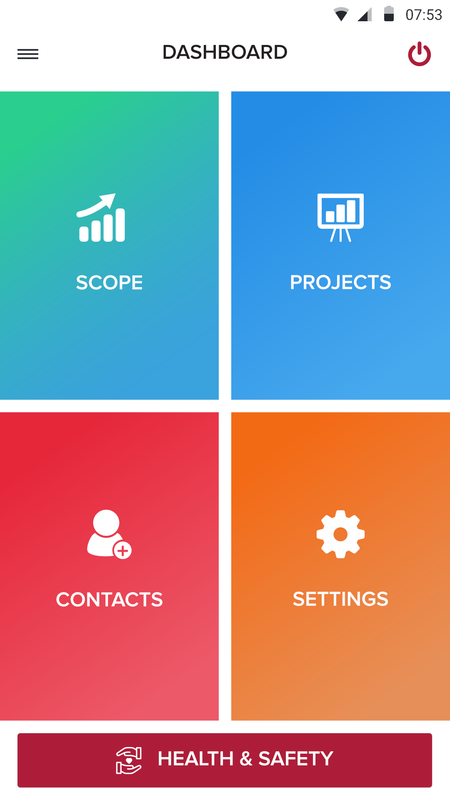 Our Project scope feature is easy for any office user and any manger/owner. Our settings page allows you to set up all your contacts, your worksheets and your service rates and the initial prerequisites for your projects. Just like our scopes page our projects page is easy to use and work. This allows you to edit/add/delete projects from your system through kore. When these are added or edited they will instantly change on your phone and your system keeping everyone up to date. All your current and upcoming Projects in one, easy to view list. Easy to use star ranking allows you and staff members to ensure vital jobs get done first. The moment that a stage of the project is complete, a staff member can update the status. Every team member instantly sees the update so everyone stays informed and ahead of the game. All previous jobs and invoices archived in one, easy to access location. Fill in the details of your every new project and they will be there for all your team to see. Contact Information, job notes, files and photographs are all easy to upload to your Job Details page, where they can be accessed by all team members. Add all the items of a new job and the cost will be calculated for you. Edit, remove or update items easily, and print paper copies of invoices or quotes if required.